One of the largest bucket wheel excavators in the world. 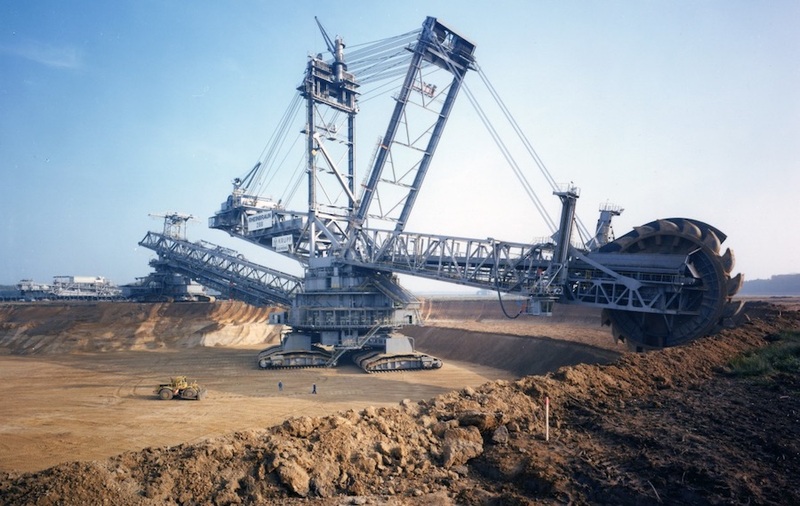 Commissioned in 1978 by thyssenkrupp, the machine is still in operation in a German lignite open pit mine. Photos courtesy of thyssenkrupp Industrial Solutions AG. When mining companies need to move a lot of material they turn to some of the biggest equipment in the business. Bucket wheel excavators, spreaders and large-belt conveyors are capable of moving up to 240,000 cubic metres of overburden a day in some of the biggest open-pit mines in the world. thyssenkrupp Industrial Solutions AG is a leading manufacturer of continuous mining systems – where material is cut from the mining face and loaded onto conveyor belts in a continuous operation rather than having to work several headings at once. The Essen, Germany-based company makes bucket wheel excavators, beltwagons, tripper cars, spreaders, and in-put crushing equipment (mobile or semi-mobile crushers), all connected to conveyors that move overburden onto waste piles or crushed rock onto the next phase of processing. With a history spanning 200 years, thyssenkrupp is a deeply rooted European conglomerate, with fingers in a number of industrial pies, including chemicals, cement, steel, fertilizer, automotive, naval technology and aerospace. Among the products thyssenkrupp is known for are elevators, passenger “skybridges” for airports, and steel – the company is one of the largest steel producers in Europe. thyssenkrupp is also into shipbuilding, with contracts to build frigates, and is a market leader in the manufacture of conventional (non-nuclear) submarines. Originally a merger of two companies – the Krupp Company founded in 1811 and Thyssen in 1867 – thyssenkrupp started off making bucket wheel excavators for soft-rock mines moving material like lignite and soft overburden, then gradually diversified to in-pit or beside-the-pit crushing systems for hard-rock mines. "While in hard-rock mines we could not apply the bucket-wheel technology, so we said, why don't we put semi-mobile crushing stations on strategic locations inside the pit or at the rim of the pit and shorten the truck haulage,” said Thomas Jabs, thyssenkrupp's executive vice president for operating unit mining systems, in a recent interview with MINING.com. While the company still makes bucket wheel excavators and other equipment for soft rock mines, about two-thirds of its order book is for semi-mobile or fully mobile crushing systems used in hard-rock mines. The equipment is used all over the world, but is particularly active in copper mines in Chile and iron ore mines in Brazil, according to Jabs. A new piece of equipment for thyssenkrupp is the BARRACUDA compact bucket wheel excavator, which is specially designed to move harder minerals like thermal or metallurgical coal, or phosphate. In May thyssenkrupp sold its first order for a BARRACUDA to China Huaneng Group, which is scheduled to go into operation next year at the Yiminhe open-pit coal mine in Inner Mongolia. The special bucket-wheel configuration allows the BARRACUDA to cut harder materials; combining mining and loading in a single machine also eliminates the need for blasting and separate loading operations, making it safer and more efficient. 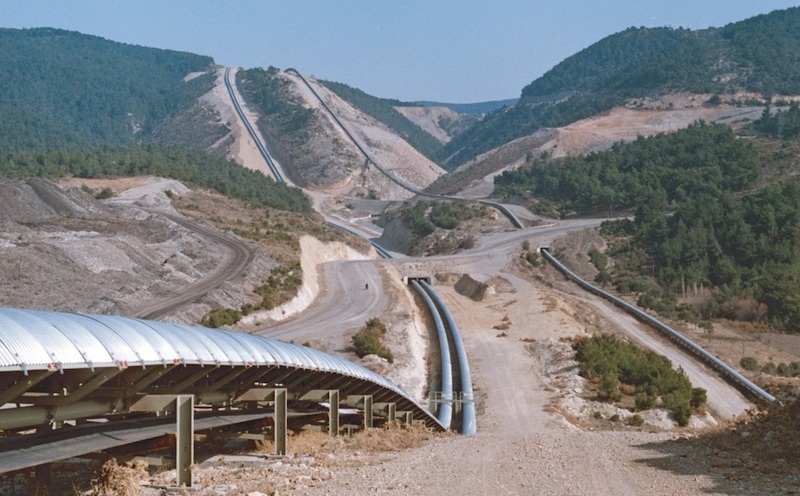 Overland belt conveyor system in Turkey transporting coal from open pit mine to power station. thyssenkrupp bases its value proposition on having a wide portfolio of continuous mining systems compared to its competition, which includes all the component parts of the systems including different types of crushing equipment such as gyratory crushers, hammer mills and sizers. When pitted against a discontinuous haul truck circuit, continuous mining technology offer a number of advantages for the mine operator. Cost savings can be achieved because the machines are powered by electricity rather than expensive diesel fuel. According to thyssenkrupp's calculations, electrically run machinery consumes significantly less energy per tonne mined, and naturally emits less pollutants. Another key factor: the equipment can be adapted to the specific conditions in the mine. Even supposedly rigid conveyors with a maximum belt width of up to 2.8m can be moved to follow the progress of mining without great difficulty. An in-pit crushing and conveying system (IPCC) is ideal for moving overburden where using trucks to haul it would be a waste of equipment and fuel. IPCCs can also cut down on the number of trucks needed. "The first evolution step is drawing closer to the face of the mine, shortening the truck distances, and therefore reducing the truck fleet. And that gives tremendous savings in operational costs for the customer," notes Jabs. While conveyors don't work in all mines, Jabs gave a current example of the Oyu Tolgoi copper-gold mine in Mongolia, where thyssenkrupp commissioned a drift conveyor to move material from underground to surface, which was cheaper than building a shaft. "We have a slightly inclined drift conveyor to the surface and that gives us an opportunity to actually get the material from underground to the surface. This is a very economical solution where we employ continuous mining,” he said, adding: "The higher the tonnage the more efficient, of course, and the more economical this continuous mining solution becomes." thyssenkrupp has also managed to integrate a mobile crusher with the driverless haul truck fleet at Vale's (NYSE:VALE) recently opened S11D iron ore mine in Brazil, proving that a continuous mining and truck and shovel operation can work together seamlessly. “The fully mobile crusher is operating together with the shovels in Carajas, and they are very proud of it actually,” says Jabs. Like other mining equipment makers, thyssenkrupp is seeing an improvement following a grim few years of belt-tightening by mine operators. Jabs said things are looking good for this fiscal year and next, with a small increase in orders and projects in the works. He said with little spent on equipment since the mining downturn began five years, ago, “we see an increasing demand for upgrades and refurbishments,” although some customers are taking a wait and see approach before committing to full replacements. Nevertheless, it's the start of a trend, and Jabs thinks it is likely to continue, comparing the current market to the start of an Indy500 car race. "As soon as the safety car goes out, everyone puts the foot on the pedal and tries to go as fast as possible. It's always all of them, right? It's not only one, everybody is accelerating. And I think that's going to come, we see that picking up, right now there is movement on the market. I think that it's going to be an interesting year next year."